Darjeeling: Now, Darjeeling and Kalimpong will finally benefit from "Nijo Griho Nijo Bhumi Prokolpo" of the Bengal government. The scheme is being routed through the Gorkhaland Territorial Administration in the Hills. The "Nijo Griho Nijo Bhumi Prokolpo" was launched on October 18, 2011 by the Chief Minister of Bengal, whereby 5 decimal of land is provided to the homeless, landless beneficiaries. "This scheme along with the rest of Bengal was earlier available in the GTA area. Initially 25% of the applicants benefitted from the scheme. However, the scheme was stopped under the GTA. 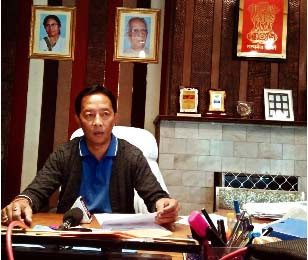 We have decided to reintroduce the scheme again through the GTA and have been given a go ahead by the State Government," stated Binay Tamang, Chairman, GTA. In a meeting on May 14, the GTA and state government officials decided to reintroduce this scheme in the Hills. A follow up meeting was held at the GTA Chairman's office in Darjeeling on Friday attended by Land reform Officers, Block Officers and GTA officials. "Application made earlier will also be processed along with fresh ones. Earlier there was hardly any promotion of the scheme in the Hills, hardly anyone knew about the scheme. This time, we will be giving advertisements in newspapers and TV channels so that people come to know about the scheme and the deserving ones get the benefit," added Tamang. Applicants can submit applications in Block Offices, Block Land and Land Reforms Office and Gram Panchayat offices as per their convenience. Committees have been constituted in each of the 8 blocks comprising Block Development Officer, Block Land and Land Reforms Officer and a member of the Board of Administrators, GTA. Applications for the Kalimpong 1, Kurseong, Mirik, Sukhiapokhari, Rungli Rungliot and Darjeeling - Poolbazar Block will be received from June 4 to June 9. For Kalimpong 2 block, it will be from June 11 to 16 and for Gorubathan block from June 18 to 23. The applications will be scrutinised by the committee formed in each block and then will be recommended by the Sub Divisional Land and Land Reforms Officer to the GTA. The GTA will then forward the list to the state following which land documents will be handed over by the state government. When questioned on the fate of tea garden workers, who have been demanding documents since long, Tamang stated: "Tea gardens are leased land of the State Government. The workers can apply. The concerned departments and the state government will then decide," added Tamang. Now, Darjeeling and Kalimpong will finally benefit from "Nijo Griho Nijo Bhumi Prokolpo" of the Bengal government. The scheme is being routed through the Gorkhaland Territorial Administration in the Hills.